The Derma-Safe Knife is a light to medium duty cutting tool. 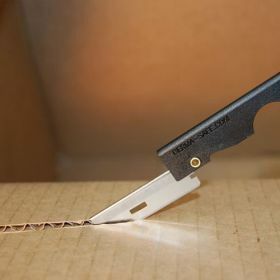 The Folding Razor Knife is a pocket size carton opener, hobby knife, detailers tool, carving instrument, electricians tool and a mini survival knife. 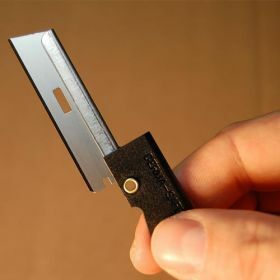 Fits inside a mini survival tin or any other survival kit where size is a concern. 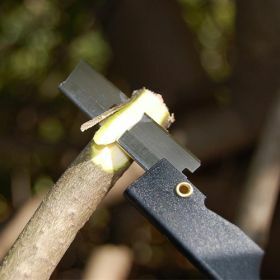 This is an inexpensive, disposable knife that is ideal for skinning operations. It features a 1.5" long, folding stainless steel razor blade with black handle. If it ever dulls, simply dispose of it. This knife is so small & lightweight that you can carry it in your pants pocket without even realizing it's there! This knife can also be used to clean fish, and would be a handy tool to keep in the tackle box or your fishing kit. This folding razor knife is approved for military use and is manufactured to military specification, offering the highest quality to civilians too. Because it weighs less than 8g with a closed length of less than 3in, this is a perfect knife for your pocket or mini survival or fishing kits. The knife is a three bevel, hollow ground, shaving quality stainless steel razor blade with a plated steel rib to secure the blade. The handle is made from medium impact plastic. It's the slimmest, most versatile knife you can find. It's capable of the kind of cutting you do on a daily basis, without any added weight or bulk.